Samsung Electronics is about to launch the LoopPay Valet, this tokenized payment device will make it even easier to make mobile payments. In February 2015 Samsung has acquired mobile wallet solutions provider LoopPay. This startup company invented a mobile wallet technology called MST (Magnetic Strip Technology). The current Samsung Pay solution is already compatible with MST, alongside NFC. As a result, Samsung’s mobile payment system is supported by considerably more US stores than those that only offer NFC, like Apple Pay and Android Pay. 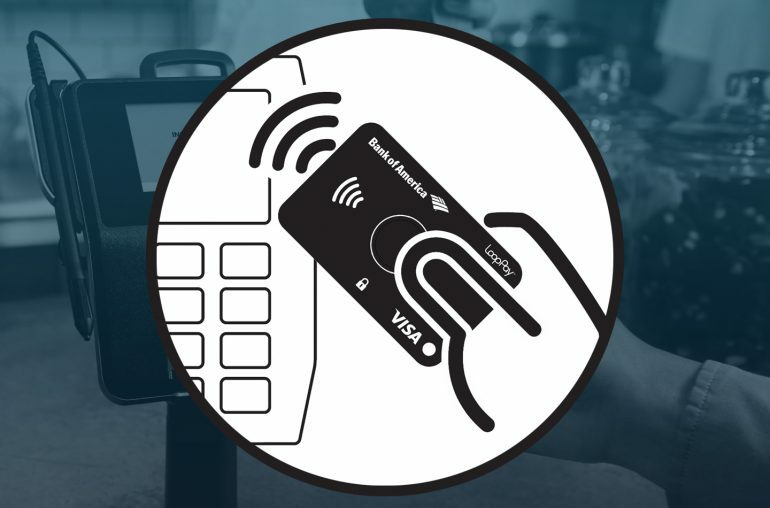 Today, a tokenized payment device for Samsung Pay shows up at FCC. 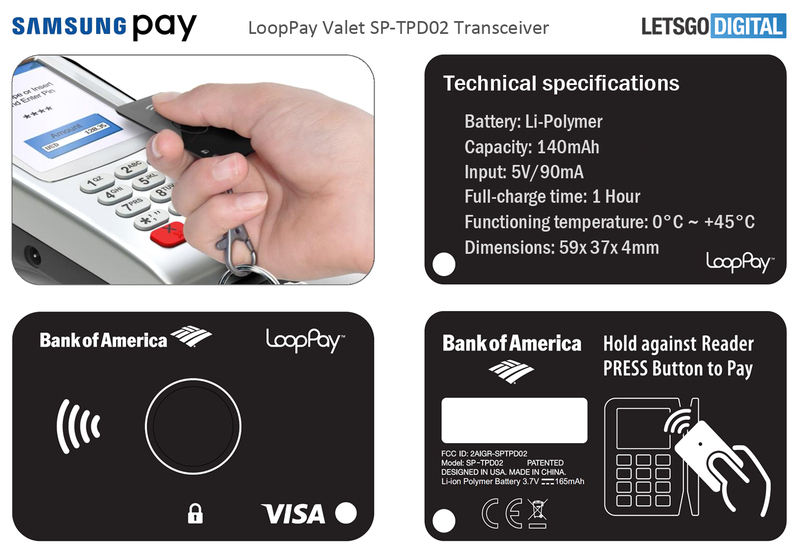 The product is called LoopPay Valet or LoopPay TPD (token payment device) and has model number SP-TPD02. The compact transceiver (5.9×3.7x4mm) supports MST and NFC technologies. It is small enough to hang on a bunch of keys. The device is controlled by a companion app over a Bluetooth Low Energy connection. The Samsung LoopPay TPD is descripted as follows: The CSM (CardSafe-mini) is a low cost contactless payment IoT device. If functions as a tokenized alternative to traditional magnetic stripe and smart VISA cards. The CSm operates pairing with a companion wallet apps application that runs on a smartphone. The app is used to manage the CSm device via a Bluetooth BLE wireless link. The mobile payment device contains two interfaces for payment transactions: NFC and Magnetic Secure Transmission (MST). The MST Consists of a H-bridge driving an inductor. The MST uses magnetic pulses generated by the inductor to induce payment tokens formatted as magnetic stripe card data, into the magnetic stripe reader of a point of sale terminal. The 13,56 MHz passive NFC tag uses load modulation to convey information to the POS terminal’s NFC reader. Depending on the type of POS, either the NFC or the MST interface is used to make a payment. The mode selection is automatic. When the SCm detects the 13,56 MHz field of the NFC reader it enters the NFC mode and disables the MST transmitter. When no NFC field is detected, the CSm uses MST to send the payment token to the POS terminal. The Bluetooth BLE operates at frequency range of 2402 MHz to 2480 MHz. There are a total of 40 channels with 2MHz channel spacing. The applicant declared that only Bluetooth BLE is used in the product. The MST operates in the frequency range between 0.8 kHz to 5 kHz. The NFC passive tag operates at 13.56 MHz. The device will be powered by an internal 3.7V rechargeable battery. The USB port is for charging the battery. Among the test documents of the FCC, we also found the user manual and some internal and external photos of the device. The user manual describes how to use the LoopPay TPD. Users can download the LoopPay app for both iOS and Android devices. After creating a LoopPay account, users can connect the device with their phone. Bluetooth has to be enabled for this. Then users can add their credit and debit cards. To make a payment, you only have to keep the LoopPad Valet near a POS terminal and press the LoopPay TPD button. The LoopPay device is packed with a 3.7V Li-ion polymer battery. The technical specifications on the enclosed picture show a 165 mAh battery, while the user manual tells us it will be a 140 mAh battery. Charging goes via the USB port and can be done via a laptop or personal computer. It will be fully charged in an hour. Now that the tokenized payment device has passed the FCC it will not take much longer before Samsung officially announces their LoopPay device, at least in the USA.